I’m passionate about visualisation. I like nice maps that display exactly the information required to convey your message. I often omit using a north arrow for instance: conventions are that the north is displayed on top, so if I’m following the convention, I prefer not overloading my maps. I also think it’s important to start interpreting the map, in order to help the map reader to quickly grasp what I’m trying to show. Click on the maps below to read how I decided to make this particular visualisation, and/or how I did it. 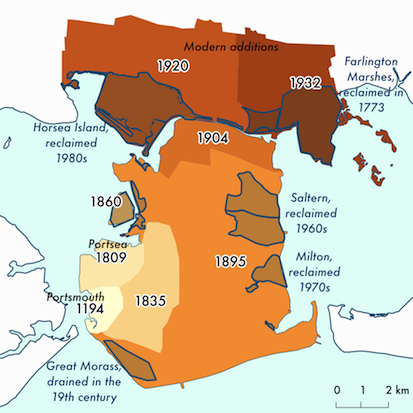 I designed this map to represent the growth of Portsmouth City, UK. I wanted to stress the progressive geographical sprawl from the harbour until the mainland as well as the importance that land reclamation had played in the development of the city.The color helps the reader to follow the spraw while the data gives the rate of increasing sprawl. 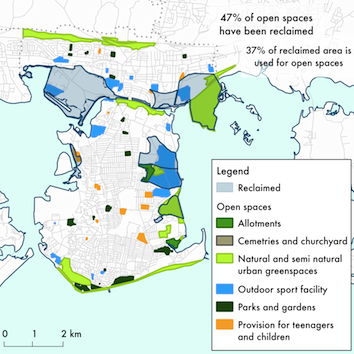 With this simple map I wanted to emphasise the location of open spaces in areas reclaimed from the sea. I inserted basic statistics into the map in order to give additional useful information. I developed an online survey with the GoogleMaps API v3 for my PhD. Among other information, participants had to indicate which open spaces they visited and where they lived. I first designed a map with all the networks on, but was satisfied with it until I read Bertin’s Sémiologie Graphique. I realised that trying to fit everything on a map was overcrowding it, losing the main information. I used the four classes created with Natural Breaks in QGIS and made these 4 maps. 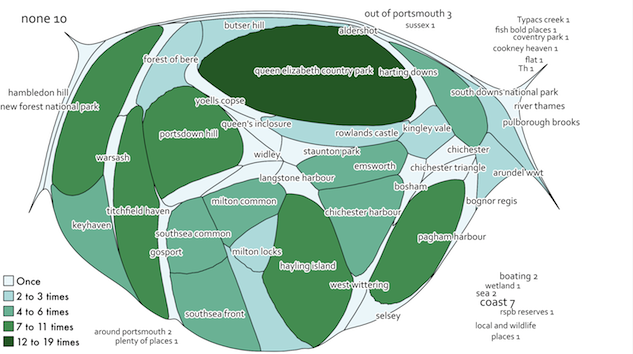 To show the distribution of the different activities pursued in Portsmouth’s parks I first used pie charts in QGIS. However, the legend required a lot of work as it was not a standard design, and also the map was not very clear. … Therefore once again I used multiple maps that could give more information and were easier to be read. The reader can then focus on the result for each activity and quickly compare. 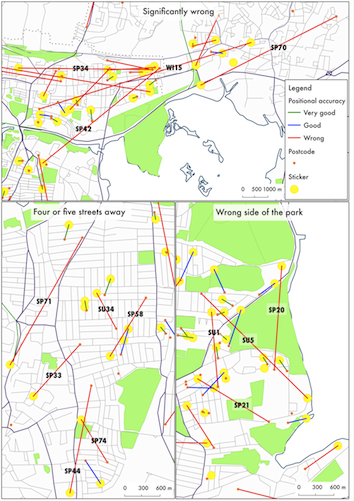 During my PhD I surveyed 150 park visitors in 2 locations. This is the summary map that I made from data gathered from 94 participants. 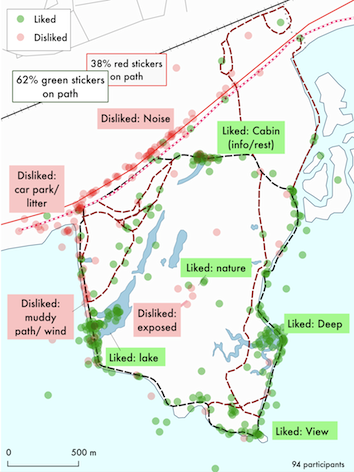 Each participant indicated*three of their favourite locations (in green) and three issues (in red). Participants were not directed to indicate specific paths or places they liked/disliked so as not to biase the results.I observed that most negative feelings were clearly directed towards the noise from the place of discontent, while positive feelings were divided between the path – where the feeling occured – and the place that made them feel it, i.e. seeing the birds on the lake from the path. 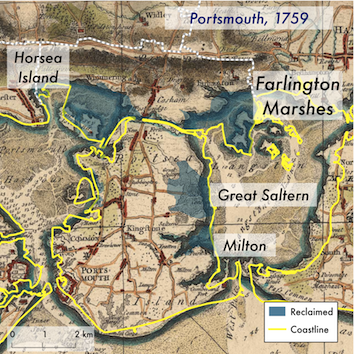 This map was made to set land reclamation into the cartographic and historic context: the 1759 map clearly shows the areas that used to be mudflat and islands. During the park surveys, I asked participants to indicate which alternative open space(s) they would use, if this park was closing.The answers spanned from specific small parks in the vicinity, to large national parks and unspecified areas.I first created a Voronoi diagram, and then used ScapeToad to create a cartogram, incorporating the number of times open spaces had been mentioned. 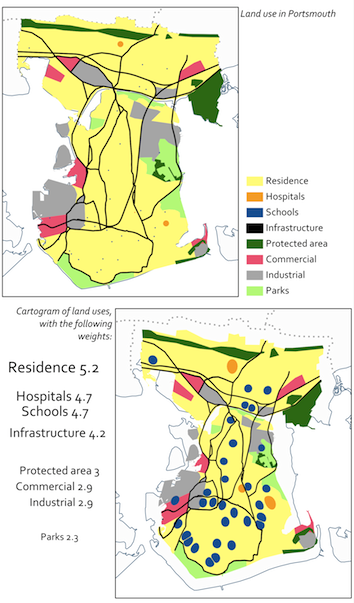 The participants in my PhD surveys were asked to prioritise land uses in Portsmouth in terms of flood protection. I used the average score derived from the collected data to create a cartogram with QGIS. 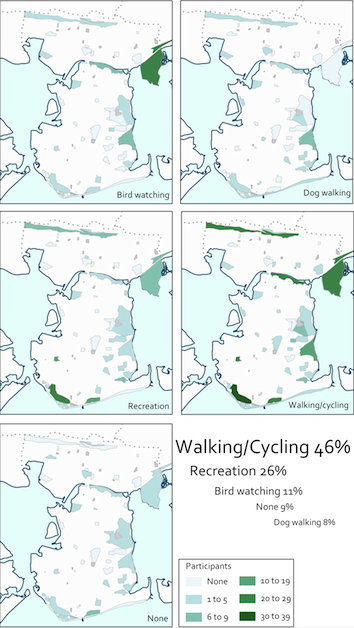 It highlights the importance to land uses given by the participants, relative to the spatial importance of these land uses. This map shows the locations of where people say they live and their postcode. 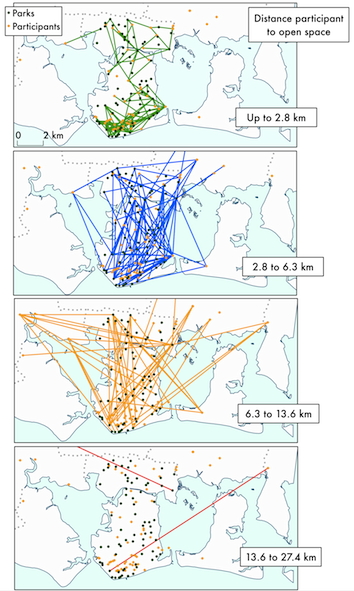 The participants in my PhD surveys were asked to prioritise land uses in Portsmouth in terms of flood protection. I used the average score derived from the collected data to create a cartogram with QGIS. It highlights the importance to land uses given by the participants, relative to the spatial importance of these land uses. Although my formal cartographic education was done in ArcGIS and MapInfo, and my first professional cartographic tool was MapInfo, I now prefer using open source software. I’ve a Mac on which I do not want to use Windows, and I think there are always good projects in the open source world. That being said, I’ve resorted a couple of times in the past years in using ArcGIS: either because that was what was required by the project, or simply because ArcGIS deals very well with unclean data..